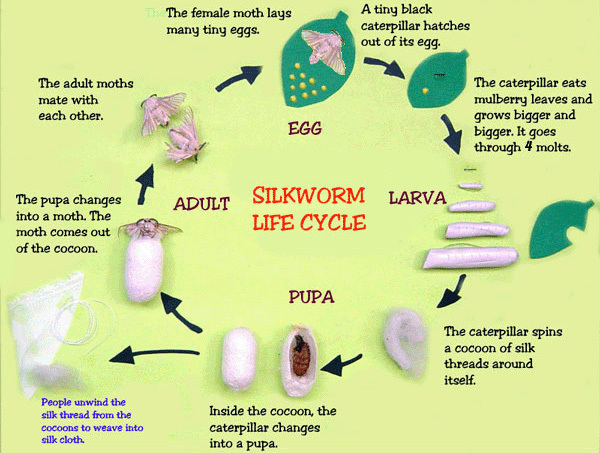 Silkworms go through four stages of development, as do most insects: egg, larva, pupa and adult. The adult (imago) stage is the silkworm moth. The larva is the silkworm caterpillar. 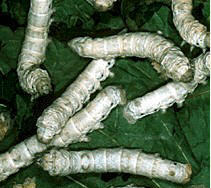 Since the silkworm grows so much, it must shed its skin four times while it is growing. These stages-within-a-stage are called instars. Mulberry leaves which are the only food that silkworms will eat. Container You can raise silkworms anywhere, but they will grow faster in a proper container. Newborn caterpillars They are very tiny and look great under a lower-power microscope! Older caterpillars Are large enough to hold in your hand and pet! Spinning a cocoon is easy to watch when the caterpillars are in a cocoon condo of toilet paper tubes. Metamorphosis is complete when the moth emerges. It can't fly and only lives for a few days. Eggs again! Once your moths lay eggs, you can start all over again! What went wrong? If your silkworms are dying, find out why. and how to fix it.